When we study blade shape, styles of curvature is one of the important points to appreciate it. We already know that, Koshi-sori is a typical style in Ko-Bizen blades, or Wa-sori is typical in Rai school. Not only the curvature, there are many points to appreciate blade shape. For example, kissaki form, fumbari, width, thickness or so. Now, we try to consider how blade shape changes by wearing or using. On the most of old blades, the shape includes some amount of change by wearing. Getting the knowledge of such changing, we can imagine the original shape of those worn blades. Koshi-sori, big curvature near the tang and smaller curvature toward the kissaki, is a character of old blades in 12th century. It is correct, but we have to know it includes some amount of change by wearing. You may know also that some blades in that period exceptionally have even curvature toward kissaki. Curvature means a back line. But the shape is not settled only by the back line. The curvature is related with the width. Therefore good koshi-sori suggests large fumbari. When hamon is worn, in other words, the hardened area becomes smaller, the stress of cutting edge also becomes less. Then the curvature becomes smaller. 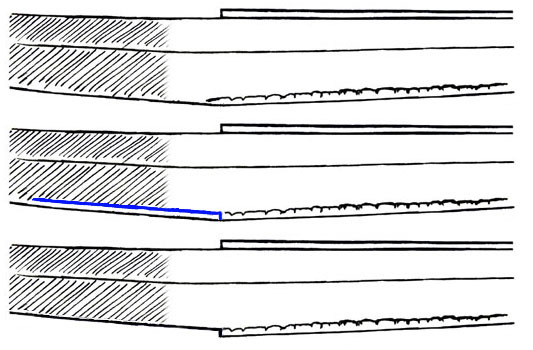 When a blade is hardened by heat treatment, some amount of curvature occurs. Wearing means an opposite effect of that heat treatment. Usually a blade tends to be worn more at the tip than at the base. Then, the koshi-sori is emphasized on worn blade. On the work to fix a broken tip of kissaki, the back is ground to keep the hamon area. In such case, the curvature near the kissaki becomes smaller. This work also emphasizes koshi-sori. The effect of wearing is not only on the size of kissaki, but also the shape of it. The blade in 12th century is formed with Kamasu style kissaki in original. Through the wearing, the edge line becomes round and the yokote line moves toward the tang. Because the tip of kissaki is the most damaged point in sword fight. On an original blade, the thickest part is the machi, the border between blade and tang. The thickness is tapered toward the kissaki and toward the end of tang, according with the width. By many times polishing, the blade becomes thinner and narrower, while the tang keeps the original. Then the thickest part moves toward the tang, and the depth of machi becomes smaller. Finally around the place where habaki put on becomes hollow. When the blade is so worn as the machi disappears, the habaki can't settle on it. Then, a new machi is made by filing. The work has to be done by professional craftsman who has enough knowledge. The rate of wearing is bigger around the kissaki than the machi, because the tip is more worn by use. So the thickness and the width at the tip becomes smaller comparing to the base. 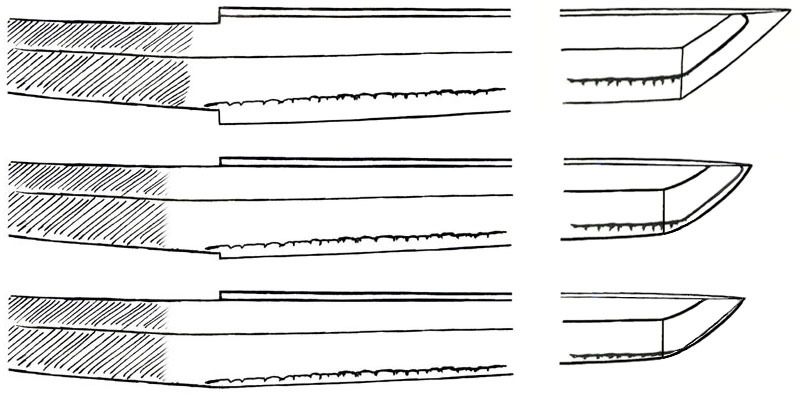 An example of changing on the width and the kissaki shape, supposing a blade from 12th century. The Mikazuki Munechika is an example of worn blade from 11th century. The hamon at its kissaki is almost worn out. The Kitsunegasaki Tametsugu, the tachi in Kasuga-taisha shrine, and the Doji-giri Yasutsuna, those we have introduced as exceptions, are examples of rarely healthy blade from 12th century. The next are examples of two Tomonari blades. One is healthy and the other is weary. Tomonari is a smith of Ko-Bizen school in 12th century.